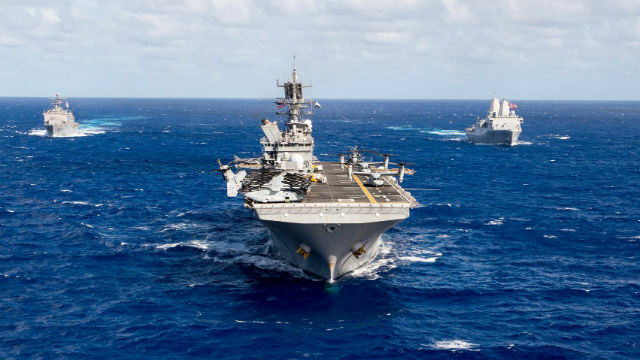 The Makin Island Amphibious Ready Group and 11th Marine Expeditionary Unit conducted amphibious training in the Hawaiian islands over the past week, the Navy reported Friday. “As we head into the Western Pacific and then to the Middle East, this training opportunity in Hawaii proved crucial to sustaining our combat readiness,” said Col. Clay C. Tipton, commanding officer of the 11th MEU. “Whether we’re bringing food and supplies to people in need or conducting a helo-borne raid to remove a high-value individual from the battlefield, the Makin Island ARG/11th MEU provides our nation with an on-call, forward deployed crisis response force,” he added. The Makin Island group is comprised of the amphibious assault ship USS Makin Island, the amphibious transport dock ship USS Somerset and amphibious dock landing ship USS Comstock. The group left San Diego earlier this month with 4,500 Navy personnel and Marines aboard for a six-month deployment to the Pacific, Middle East and the Horn of Africa.